Please note that this document is out of date. You should now download Shotgun Desktop from within Shotgun following the instructions in our Shotgun Integrations User Guide. Want to see what the Shotgun Pipeline Toolkit is all about? This document explains with simple, step-by-step instructions how to install the Shotgun Desktop and setting up your first Toolkit project. This document is out of date. You should now download Shotgun Desktop from within Shotgun following the instructions in our user guide. Information on how to configure Desktop and setup a project has moved to our admin guide. This document describes how to install and configure Toolkit and Shotgun Desktop. We recommend that you start here when you want to try out Toolkit for the first time. Just follow the instructions step by step, and we'll guide you though setting up Shotgun Desktop and then Toolkit with default settings in a test environment. Once you have set up your first project, you can try it out, tinker with it, take a closer look to see how it works and understand how it can work with your pipeline. Learn how to make Toolkit create folders and disk and how to set it up work with your studio file naming conventions. In order to run Shotgun Desktop and the Pipeline Toolkit, you need to have a Shotgun Site up and running. If you don't, please head over here where you can get set up with a free Shotgun trial account. It all starts with the Shotgun Desktop, a software application which extends the Shotgun experience on to your local machine and makes it easy to access Shotgun data, launch applications and run pipeline integration tools directly from your machine. Shotgun Desktop also handles installation and maintenance of Toolkit projects. The links above point to the latest release. When you have downloaded and installed Shotgun Desktop on your machine, double click to launch the installer! Please note that you may need administrator privileges to install the application on your machine. See the documentation in our Admin Guide for how to configure Shotgun Desktop. > Command line based activation. If you are part of our Shotgun Desktop pilot program, and already have a pilot version of Shotgun Desktop installed, you need to uninstall this before you install the official release. In addition to this, you also need to go to Shotgun, locate and delete the primary pipeline configuration for the Template Project. If you need any help with this, just drop us a line on support@shotgunsoftware.com. Cannot set up this project! Non-auto-path style pipeline configuration entries already exist in Shotgun. On some versions, compat-readline5 is also required (64 bit). What if you already have Toolkit set up in your Studio? 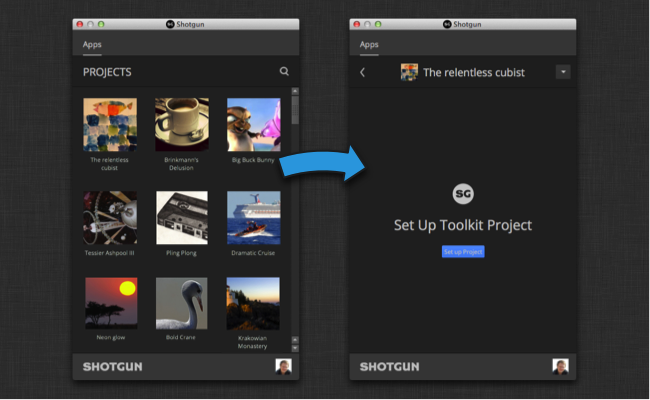 If you already have Toolkit running in your studio, Shotgun Desktop will not change any of your existing workflows. It will read your existing pipeline configurations and when you click on a project in the project overview, it will try to load the project environment for that project and then start the desktop engine. If the desktop engine isn't found, you can click a button and Shotgun Desktop will automatically copy your existing Shotgun action menu items and use those entries to create a desktop engine configuration. How does the desktop install process work exactly? Will it affect my existing setup? Shotgun Desktop will not make any changes to any existing project configurations or other setup items without your consent. After you have installed it, started it up, and logged on with your normal Shotgun user name and password, Shotgun Desktop will create what we call a site configuration. This is a new type of pipeline configuration which isn't associated with a particular project, but instead represents the entire site, with all its projects. You can see this site configuration in the form of a pipeline configuration entry which is associated with the default template project. Also please note that by default, this pipeline configuration has got blank path entries. This means that the configuration runs in a new auto path mode, where it doesn't need to reside on a particular location on disk. Instead, Shotgun Desktop will manage the location of the site config and install it automatically for you on your local machine. This site configuration does not need to be maintained like a normal project (using the tank updates and tank core commands). This would not be practical, since there is a site configuration on each local machine which has Shotgun Desktop installed. Instead, is updated automatically every time you start up Shotgun Desktop, ensuring that all users are running the same (latest) version. Please note that it is perfectly possible to change the behavior of this site configuration to behave exactly like a normal project. Simply add path entries to the site pipeline configuration in Shotgun and move your local site configuration into this location and this configuration will behave just like any other project. Once you have specifically set the path to the site config, the automatic updates will also stop. It is also possible to specify a site configuration root path in an environment variable TK_SITE_CONFIG_ROOT. This is a good way to test out changes to the site configuration prior to release. Note, however, that install_location.yml must be updated with the path of the specified config for the configuration to be actually used. If you are running a locally hosted Shotgun or using a proxy server, please see the advanced section above for advice and options. If you are interested in setting up Perforce or the games configuration, additional steps beyond the installation are necessary. Please contact us and we'll be happy to help out! As always, if you have any questions or need any help, never hesitate to reach out to us on support@shotgunsoftware.com. We'll be happy to help out and guide you through the process. 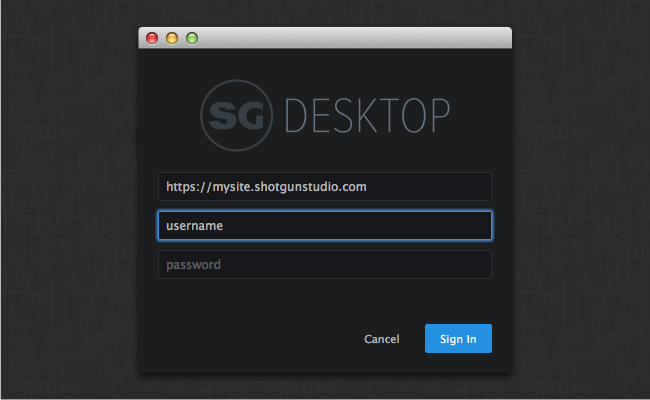 When you launch Shotgun Desktop for the first time, it will ask you to log on to your site. Note! The very first time you log into Desktop for a Shotgun site and any time you are setting up a Project, make sure that the user that you are logging in as has administrator privileges, otherwise some of the setup steps cannot be carried out. 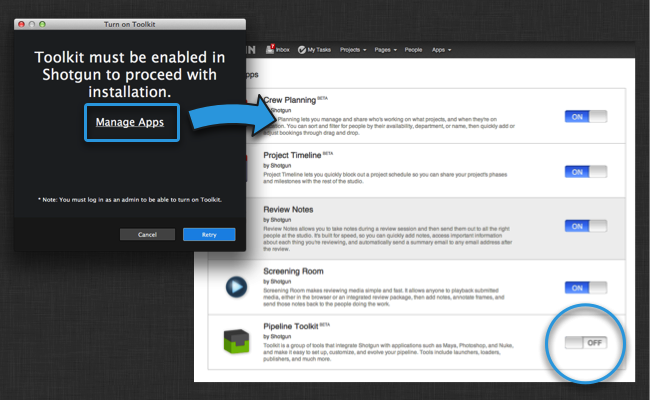 Now Shotgun Desktop will prompt you to jump to the App Preferences and turn on Toolkit if you haven't already done so. Once Toolkit has been turned on, Shotgun Desktop will initialize itself and after a brief delay, you will see an overview of all your Shotgun projects. Now, if you click into a project, you can proceed directly to the Toolkit project setup wizard by clicking the "Set up Project" button. I got everything working but I don't see the desktop wizard, how do we start it? @hassan What platform are you on? And at what point does that error appear? I'm facing this problem on both platforms Windows/Mac screenshots attached. He opened a support ticket with us about the rpc error which we tracked down to some files not being installed correctly. Once they were installed everything started up. Ditto on "whats missing are the app launchers for multiple versions"
I'm trying to set up a proxy server connection via the shotgun desktop app on windows. I've set up the config.ini file and it gets the default site and user settings, but the http_proxy value isn't working. Any chance of getting official support for Centos 7? When I try to install it complains there are 2 dependecies missing, which are not in the repos (yet). Hi there, Great work on this! I have one question though, is it not possible to use the new Publisher app from a toolkit config? I created a new project which had the publisher working nicely, but when I converted that project to a toolkit project, the publisher disappeared. Where can I find the documentation to add the stand along publisher to our toolkit configs? That would install it for Maya when running in an asset context. In this way it will work just like any other app in our integrations. I am getting this error while I am setting up. Can you please tell me why I am getting this? This error won't go away.